The ABSU is going to observe the Bodoland Martyrs Day on 12 June 2017 at Bijni District Play Ground. This event will be observed with grand mass gathering to voice the unresolved Bodoland State Demand. The ABSU is continuing the movement since 2010 for a separate Bodoland State. It is indeed have become more rigorous by the participation of the armed revolutionary NDFB(P) post ceasefire with the government of India to resolve the statehood demand through dialogue with the government of India and PJACBM has also become the part of the movement since its inception. It must be mention here that the thirty years ago the first Bodoland Movement cadre Sujit Narzary was attacked by the anti movement miscreants on return from the rally at Guwahati in the year 1987 12 June. The All Bodo Students Union had declared the First martyr for the cause of Bodoland Movement is Sujit Narzary who was then the student of Class IX at Kokrajhar H.S. 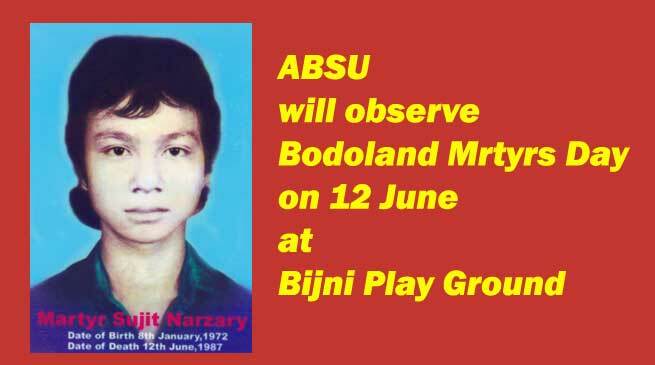 Since then the ABSU observing the 12 June as the Bodoland Movement Martyrs’ Day every year commemorating all the members and cadres who have sacrificed their life for the statehood movement which has become the legacy for the lives of 1135 people during the period of 1987-1993. The historic observance of the Bodoland Movement Martyrs’ Day at Bijni will be participated by the leaders who have become the living example witnessing the movement. ← IMC set the future road map for the Swachh Abhiyan.